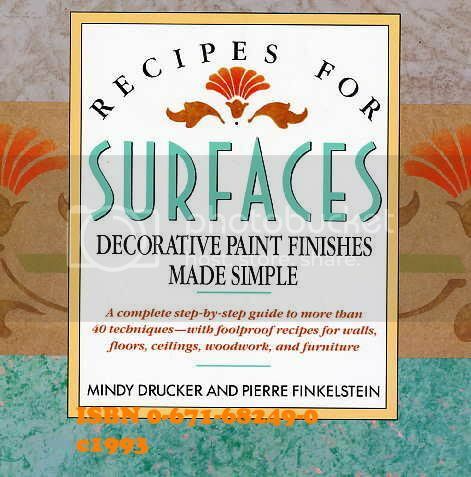 This is a more complete course of decorative finishes, then the other three books, I have reviewed recently. It is divided into two sections, the first being general information of color. Chapter 6 Cloth Distressing, the effects that can be achieved with a rolled up rag or cheesecloth. Chapter 7 Stippling, from one color to three and fade-away. Chapter 8 Color Washing, sponge and brush to fade-away. Chapter 9 Spattering, spatter on, spatter off, spattering over sponging in five colors and a stone-block effect. Chapter 10 Dragging, with steel wool, a hard bristle brush and combing effects. Chapter 11 Stenciling, making your own and work with them. Chapter 12 Marbling, assorted colors, application on a column and doing a floor. Chapter 13 Wood graining, Pine, Oak, Mahogany and Burl. And finishes up with Bibliography, Sources(US) and index. In the assorted topics they have boxes with the recipe of how difficult it is number of paint cans one can is easy, etc. To the supplies and tools along with the paint needed and if you will require help or a second person.